For brides who are looking for new types of wedding flower bouquets and for unconventional types of flowers that are not very common. Popular in weddings you can choose the unique magenta dahlia wedding bouquet. Dahlias are not very popular when it comes to wedding floral arrangements, wedding decors or bridal bouquets. But once you get to see how splendid and lavish they look in a bridal bouquet you will hopelessly fall in love with them and perhaps consider them for your own wedding. Dahlias look great when incorporated in tropical wedding bouquets, or in vibrant exotic summer time wedding bouquets. The many colors that are available for dahlias can also influence you or determine you to choose them as your wedding flowers. 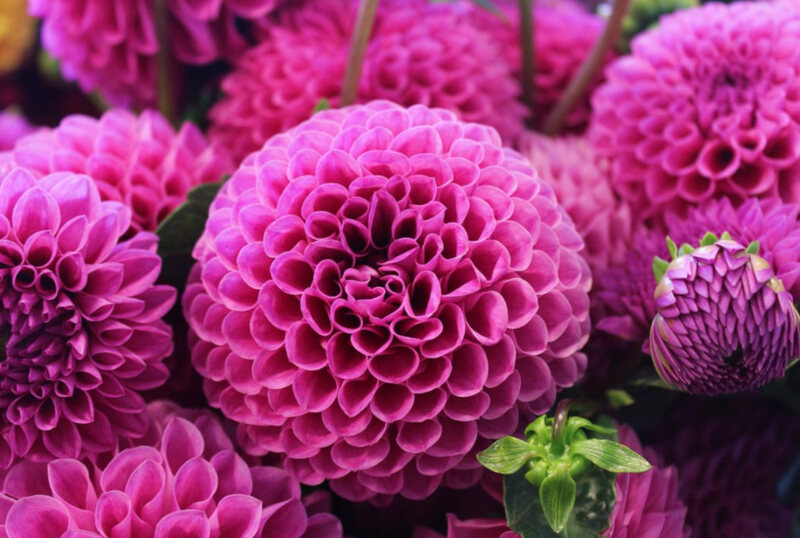 You can find dahlia wedding flowers in shades of white, red, orange, purple, hot pink, green, burgundy, black, violet, yellow or in bicolor species. We consider that a magenta dahlia wedding bouquet can make a strikingly beautiful and unexpected apparition on any type of wedding booked for a natural or a tropical location. The magenta color is one of the most fashionable colors that are in vogue at this moment especially among young modern brides who are planning a vibrant, cheerful, playful, energizing and joyful wedding. Choosing a more sensational, richly and dynamical color scheme or theme for your wedding could be a great way to a successful event. You’re not forced to go white when you don’t really feel like going white. The palette of choices in matters of colors and flowers is generous enough to fit and flatter any personal style, taste and preferences of any kind of bride. 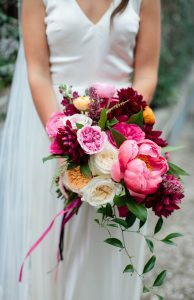 No on tells you what types of flowers or colors to pick for your bridal bouquet. You need to find your own style and choose it according to the main aspects or characteristics of the wedding such as the location, the season, the formality, the theme and the color palette chosen for the even. A magenta dahlia wedding bouquet can make any bride look truly mesmerizing, outstanding, more remarkable and original. Among so many contemporary brides who still decide to go with roses you will be able to step out of the crowd and make a difference. Dahlias can be beautifully combined with other similar or matching types of flowers like mums or chrysanthemums, marigolds, sunflowers, gerbera daises, narcissuses, peonies, lilacs, lavenders, anemones, ranunculus, tulips, amaryllis, orchids, calla lilies, hydrangeas, stephanotises, garden roses, hibiscus, tuberose, freesias, delphiniums or gladiolas. You can combine the magenta-pink color with other shades like purple, light violet, hot pink, fuchsia, pale pink, baby blue, turquoise, navy blue, lime green, peach or vintage orange, white, cream, beige, chocolate brown, gold, maroon, champagne, ivory or yellow.